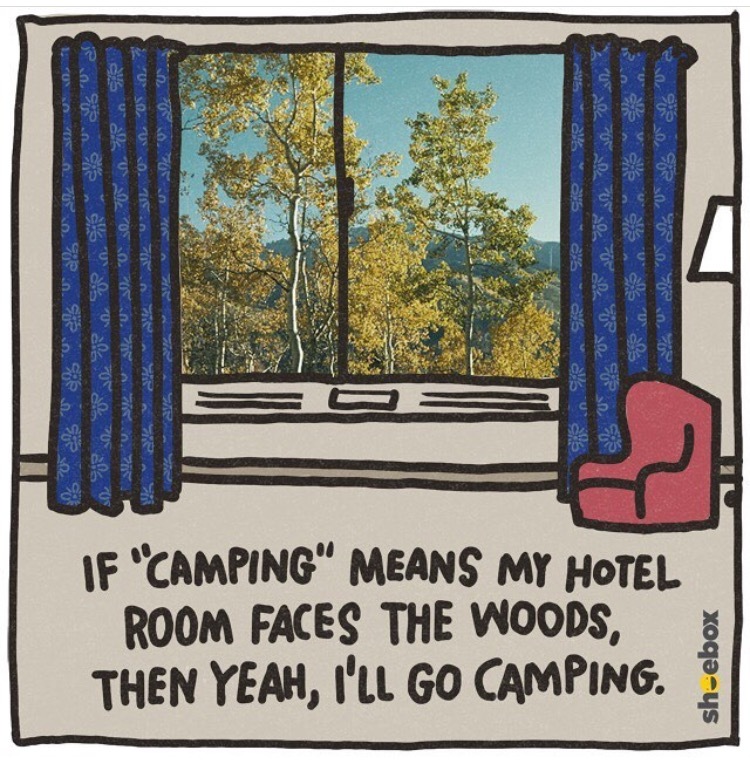 Ed asked me today if I'd go camping. After I stopped laughing, I thought "Did he just meet me yesterday?". I have only camped once if you can even call it that. I don't think it was considered "real" camping because there were port-a-potties, but I know I slept in a tent. For one night, with three other people. It was in Central Arizona, at Apache Lake, over twenty years ago. The only thing I remember is that I felt as if I were sleeping in a zip lock baggie, suffocating from the heat. I also slept on a rock all night, and I can tell you it was no Princess and the Pea scenario. Never again. I can't imagine I'd be very interested in camping at this age. I like comfort and luxury and air conditioning way too much. I've had to dismantle air conditioning units in hotel rooms to override the thermostat. You know they rig them, right? That's probably the only gadget I have mastered and I learned how to do that years ago. I can't stand a warm hotel room, can you imagine what I'd be like in a tent?? I don't even want to utter a maybe because I don't want to be held to it, but I could possibly consider it if the weather circumstances were favorable. Which essentially means around 65 degrees. It's going to take a lot of thought and even more convincing. I don't even think even Glamping is going to cut it for me. Who knows what will happen, though. Ed has me getting a motorcycle endorsement "just in case" I want to ride someday. It's going to be a real feat for him to break through the anti-camping barrier.